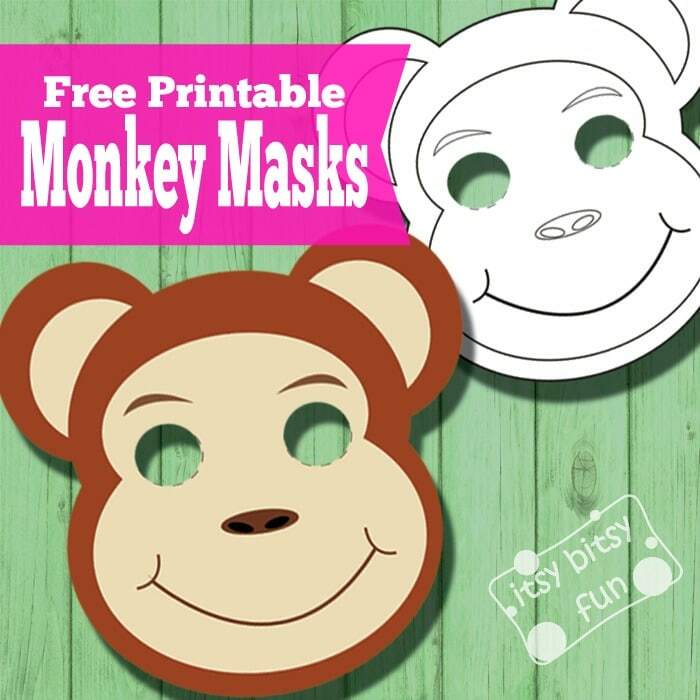 Let’s do some monkey pretend play with these printable monkey mask templates! There’s quite a few animal masks in my free printable masks collection – your kids can already start their own zoo! As a kid I wanted to have a pet monkey… Don’t know why but I begged and begged my parents to get me one. Thankfully they knew better and never for a second considered of actually getting me one. But I did get a plush gorilla. He was awesome! First cute and cuddly and then after I saw King Kong he was terrorising my Barbies! As you noticed I really think monkeys are awesome and these printable masks will allow for some awesome pretend play! First we have a pre-colored “ready-to-go” mask. Print it out on harder paper and cut out the holes for the eyes and holes for the string (or just glue the mask on a stick). If you have a thermal laminator do laminate it to make it last longer. This one is perfect for preschoolers and kindergartners. Before the kids get to wear these they will have to color them! While brown will probably be the most popular to color these I do hope some of the kids will get even more creative and go crazy with their colors!